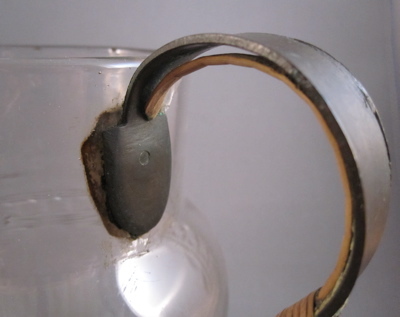 I had never seen an early metal replacement handle found on a piece of glassware, until now. 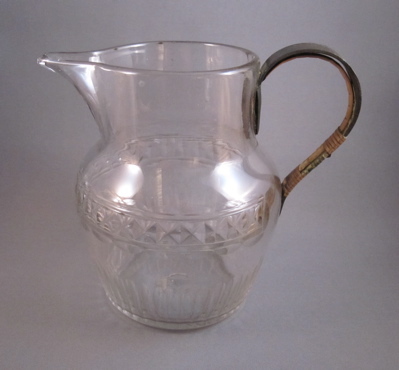 This blown glass baluster form jug with cut decoration stands 5-3/4″ tall and was made in England in the late 18th to early 19th century. 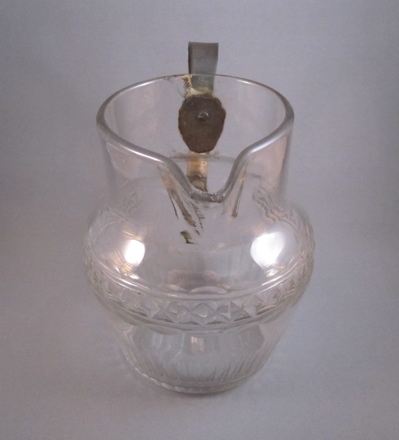 Etched on the underside is a cursive signature, Neale & Co. WH, above an unpolished pontil scar. 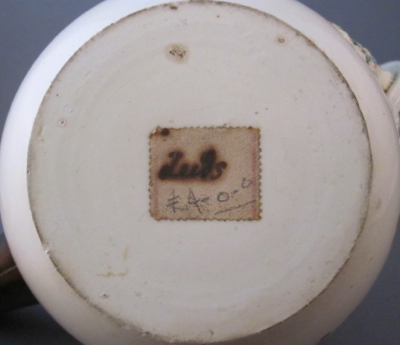 James Neale, a London merchant who opened the Church Works in North Staffordshire in the second half of the 18th century, was famous for producing earthenware in the style of neighbor Josiah Wedgwood’s ubiquitous pottery. 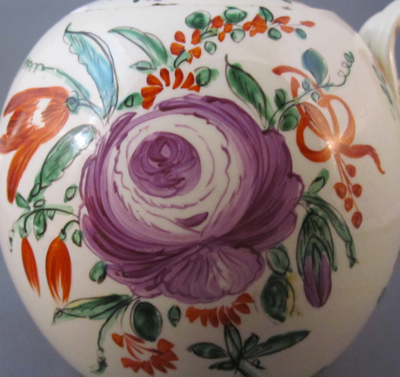 Neale’s wares were of the same fine quality and though rivals, he helped Wedgwood, when in a pinch, with large orders that needed to be filled. 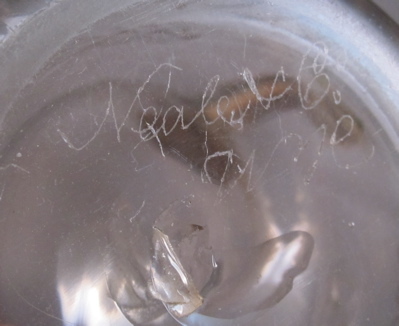 Though known mostly for producing ceramic tableware and figures, Neale & Co. also housed glassware merchants at the Church Works, which explains why this unusual mark is found on my glass jug. As I usually come across either handles still covered in rattan or exposed bare metal handles with all covering long gone, I was pleased to find this hybrid. It reveals a half-round crimped support strip of rattan along the interior of the handle, and also shows the remains of a decoratively woven outer cover. 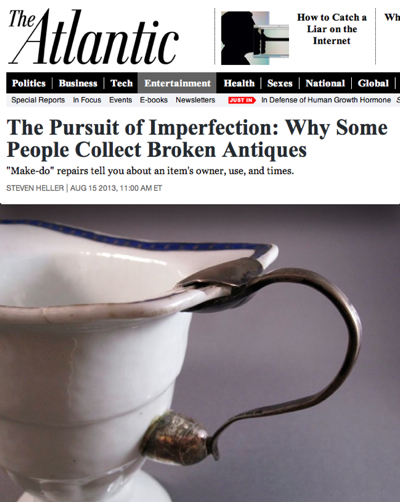 Pieces such as this seemingly inconsequential imperfect repair help collectors and scholars discover the early methods of repair and insulation. 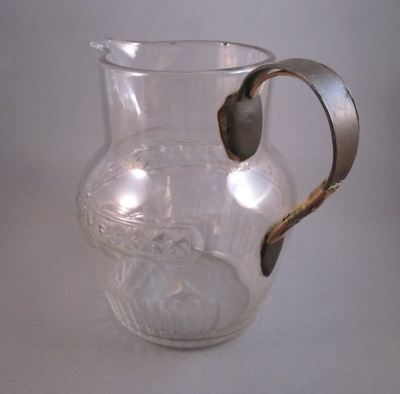 So thanks to those who owned this wonderful jug before me, keeping the remains of this most inventive repair intact! 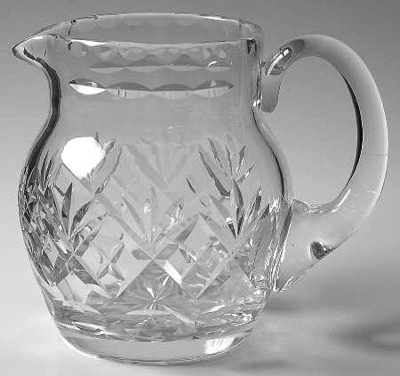 This crystal jug shows what the original applied handle might have looked like on my jug. 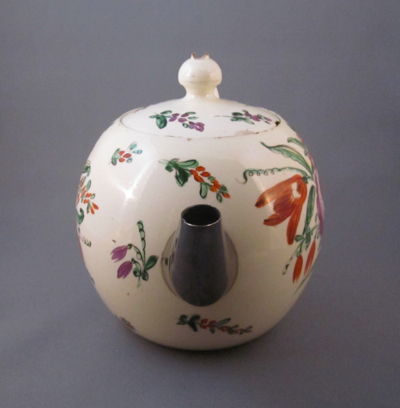 I had been looking for an 18th century creamware teapot for many years so I was excited to have recently come across this appealing example with a most unusual, if not unique, repair. 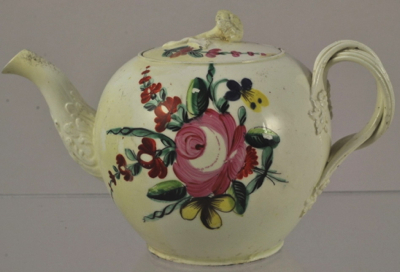 This globular teapot, which measures 5-3/8″ high and 8″ wide, has an entwined strap handle with floral and leaf terminals and a cover with a pierced ball finial. 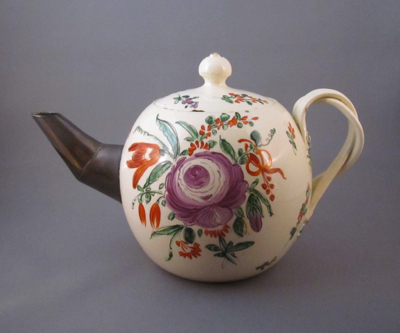 The hand painted floral polychrome decoration is in tones of purple, green and persimmon. 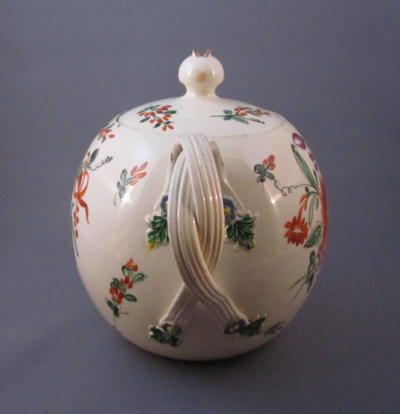 It was made in England during the last quarter of the 18th century at Leeds, a factory famous for developing creamware, a new type of earthenware using white Cornish clay and a translucent glaze. The underside reveals an early gummed paper label marked “Leeds” and a price of £4, which I would happily have paid. Of course it cost me a bit more, but I have no regrets. 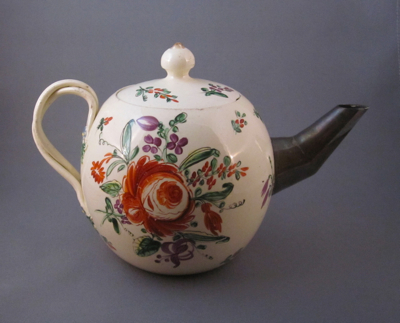 This example, with similar form and decoration, shows what my teapot’s spout would have looked like had it not broken off. 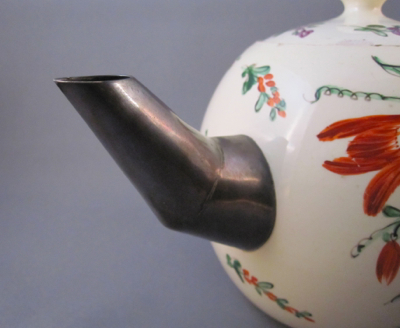 But I much prefer my unique example with the juxtaposed metal spout.